Superior, Wisconsin, was organized as a city in 1854, just a year after the first log cabin was built along the shores of the Nemadji River. Less than two years later—in January, 1856—Superior’s residents were calculating how many school-age children lived in the community and, therefore, how many schools it needed to build. The Fairbrass Census, thought to be the first reliable report, counted 80 children below the age of 5. There were also 50 children listed between the ages of 5 and 15. These numbers showed how quickly Superior grew from a remote village of frontiersmen, speculators, and prospectors into a community of families. Realizing the need for a schoolhouse and teacher to provide instruction, Douglas County residents formed School District #1 and levied a tax to create funds. Before the month was over, Superior’s very first school building stood at the corner of Third Street and Nelson (now 30th Avenue East). The one-room structure was built in such haste that the logs were not given time to cure. Wood heat warmed the building during school hours—and also dried the green logs, which shrank considerably leaving gaps in the chinking, letting the cold wind and snow blow through. The building proved so deficient that a new school, long known as the Becker Avenue School, was constructed on a nearby site and ready for classes the following September. Soon after the formation of the first district, those living to the north and west of the Nemadji River area organized School District #2. A second school building was erected on Fourth Street and L Avenue (now 6th Avenue East). Nearly ten years later, in 1865, a third district would emerge and within weeks the three districts combined to form the Union High School District—the precursor of today’s School District of Superior. A major focus of the new, combined district was to provide opportunities and resources for secondary education in the hopes of stemming the significant drop-off rate among students beyond the age of twelve. Irvine W. Gates, an early teacher and administrator in Superior, created entrance exams and a curriculum for secondary education within the school system. High school instruction was then concentrated in a few certain schools throughout the city. Superior would not have a designated public high-school location until 1892, when a contract was made with a private individual for the construction of a building on Broadway between John and Hughitt Avenues. The school board had no investment in the construction or the finished building. They simply agreed to lease the completed facility for a period of no less than three years. The lease was not renewed in 1895 and the building was remodeled into the Broadway Apartments, which was destroyed by fire long ago. Beginning in 1895 the school board rented rooms in the Broadway Hotel for use as a high school and fitted them out accordingly, but the space proved unsatisfactory. In 1900, a large and well-equipped building for the specific purpose of high school education was finally erected, paid for, and owned by the school district—but not as a stand-alone school. It was built as an addition to Blaine Elementary School at 14th Street and Hughitt Avenue. This location served as a high school for ten years. The Nelson Dewey School, built in 1888 and one of the few early locations conducting high school courses, continued offering secondary instruction in competition with the Blaine High School. However, Nelson Dewey lacked the space and modern laboratory equipment to be recognized as an accredited high school by the State of Wisconsin, and students graduating there were often refused acceptance into state universities. By the turn of the Twentieth Century, the population of Superior had reached 31,000. The Morning Leader of July 18, 1902, reported a school census of 7,733 students. The eleven public schools serving the district at that time included Nelson Dewey and Blaine elementary and high schools as well as Lincoln, Kimball, Carpenter, Ericsson, Howe, Bryant, and Cooper elementary schools. The school board again took up the cause for a new, modern, and centrally located high school to serve the educational needs of the city and provide quality, accredited secondary instruction. They put out a call for design plans for a new two-story building to be located in the heart of Superior, on Belknap between Grand and Weeks Avenues. Many of Superior’s early school buildings had been designed by architect Carl Wirth, brother of famed St. Paul and Duluth architect George Wirth. Wirth fell out of the bidding when he submitted a design for a three-story structure, believing that the board’s plan for only two stories was insufficient to accommodate the increasing school population. The bid was instead awarded to Earl W. Barber, who submitted a two-story plan as requested. Oddly enough, the board then asked Barber to amend his design to include a third story by the time construction began. The contract for construction of the new school was awarded to Emil Sedlacheck. Work began in March of 1909. The cornerstone was laid July 1 that same year, but work continued for another full year before the school opened in September of 1910. The total cost for the district’s first public high school built as a stand-alone facility and for the sole purpose of secondary education was $283,892—$23,892 of that amount was in payment for the site. Built of brick and Lake Superior sandstone, the completed building featured a stately central entrance with wide stairs leading up to a double doorway. The doors were framed by piers providing a base for four columns topped with Ionic capitals—two on either side—all supporting a parapet over the entry. Between the columns and the parapet a frieze contained the words “Superior High School.” Medallions on either side of the parapet contained carved images of books, appropriate for a grand house of learning. Inside, the building housed seventy offices and classrooms, a spacious auditorium, and a lunchroom with room for 200 diners. The building welcomed the first incoming class of students in grades 9 through 12 in September of 1910. In 1923 the school board approved a $177,830 addition to the building, named for Andrew J. Webster, president of the Webster Chair Manufacturing Company in South Superior. Webster had bequeathed a large sum from his estate for the construction of the addition. The Webster Addition housed classrooms for the manual arts, domestic sciences, and commercial courses in office skills and business administration. It also included a complete print shop where, among other print material, students produced the school newspaper, The Devil’s Pi. Because of high unemployment in the city, there was strong support for the new addition to be built 100-percent by Superior laborers and contractors, for the 150 tons of steel for the structure to be fabricated at the Superior Shipbuilding Co., using local workers, and for the forty-five to fifty men employed on the job to earn fifty cents per hour instead of the twenty-five to thirty cents paid to workers by out-of-town firms. By Meronek’s account, the bid accepted by the Board of Education was indeed higher than those placed by out of town firms, but he work was kept in Superior. 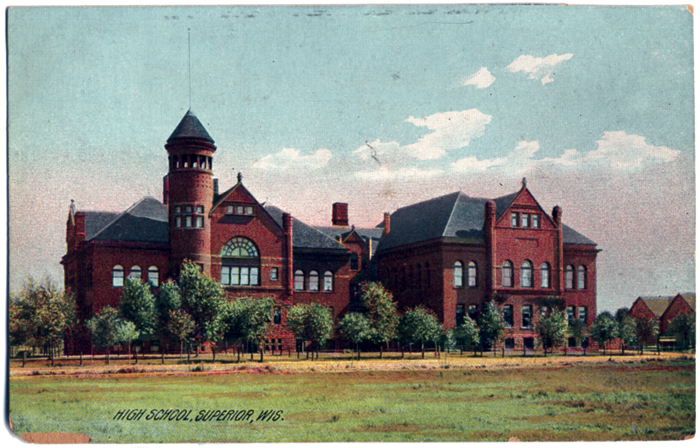 Shortly before the Webster Addition was added to Superior High School in 1923, East High School was built at 18th Avenue East and East 5th Street. At this time Superior High School became known as Superior Central High School. Central and East High Schools continued to offer secondary education to Superior students through 1965, after which all public high school classes were moved to the newly constructed Superior Senior High School at 2600 Catlin Avenue (now Superior High School). At that time, Central and East became Jr. High Schools and later middle schools. Both schools closed in early June of 2003, replaced by a new middle school located at 3626 Hammond Avenue. Both former public high schools were razed in 2004. Superior Central High School stood for nearly 100 years, graduating 55 classes of senior students, to date the most classes of any high school in the city, past or present. Graduates include many famous personalities, including WWII flying ace Richard I Bong, legendary Minnesota Vikings Football Coach Bud Grant, Olympic-medal winning curler Ray Sommerville, and NFL star Ernie Nevers, and many other notables.